Carl Pei is only 25 and his one-year-old startup has set out to figuratively kill the other leading smartphones in the market. It's certainly an ambitious goal for a Chinese company few may have heard of. But last year, his company OnePlus came out with a phone marketed as the "Flagship Killer" that went off and became an underground hit -- not just in China, but also in the U.S, where the demand has outstripped the supply. "We basically weren't prepared for what happened," said Pei, who is a co-founder of OnePlus. "We thought that all our demand would be in China the first year." The company has only sold close to 1 million units of its first flagship phone, a drop in the bucket compared to the tens of millions Apple and Samsung sell annually. But OnePlus is one among Chinese smartphone makers who are rising fast, and could end up luring customers in the U.S. with the promise of cutting-edge devices at prices that undercut the competition. That's already happened in China, now the world's biggest market for smartphones. Apple and Samsung still remain popular brands, but Chinese companies such as Lenovo and Xiaomi have risen to become leading vendors in the country, by selling feature-packed Android handsets that come at low prices. Scores of other Chinese companies, such as Huawei, ZTE and Yulong, the maker of the Coolpad, are doing the same. OnePlus has taken a similar approach. 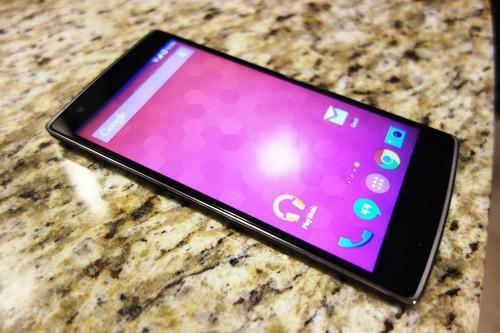 Its flagship phone, the OnePlus One, has generated a lot of international buzz because the product is such a good deal. Starting at a no-contract price of US$299, the 5.5-inch phone offers cutting-edge specs, for essentially less than half the cost of what a Samsung Galaxy S5 or iPhone 6 goes for when bought without carrier subsidies. Pei compares the company, which has 600 employees, to a Silicon Valley software startup that's focused on offering a free product. "Once you have a user base, then you can monetize," he said on Tuesday, while attending the International CES show in Las Vegas. Launched back in April, the OnePlus One isn't exactly free, but it's priced just above the cost it took to make it. The Android phone features a 1080p screen, a Qualcomm Snapdragon 801 processor, 3GB of RAM, and a 13-megapixel camera in the rear, among a whole host of features one would only expect in a high-end device. Consumer response to the phone caught the Chinese company off guard. Originally, OnePlus estimated that product sales might reach between 30,000 and 50,000 units. By November, however, the company had sold half a million, or about "ten times more," Pei added. But unlike other Chinese smartphone makers that have first focused on the home market, before going international, OnePlus began selling its handset to foreign markets from the outset. "The Internet has made the world so flat, you can communicate with anyone, anywhere nowadays," said Pei, who grew up in Sweden, and leads OnePlus's 80-person international team. "I don't think there is a reason to limit yourself anymore. If it's a good product you should share it with the world." Sharing that product, however, hasn't always been easy. In a way, the OnePlus One is a bit too good to be true. The company has thin profit margins, and doesn't want to overproduce stock that it won't be able to sell. As a result, supplies of the phone have been limited. The company sells its product directly to customers through its website, cutting out the need for resellers or physical stores. But to obtain a phone, a customer has to go through the company's "invite system." In the U.S., for example, consumers interested in buying the device, have to first receive an invite from someone who already purchased the product. Or they can receive an invite by participating in the company's online contests. The system rewards the more devoted followers, but has made the product tough to buy. Back in October, when the company briefly opened sales to all U.S. customers, the OnePlus website for orders temporarily went down due to all the traffic. "The user experience from our side hasn't always been the best in 2014," said Pei, who noted that the U.S. was one of its bigger markets. Given that OnePlus has become aware of the demand, the company will pump out more units to prevent shortages, although it will still be cautious to not overproduce, Pei said. "In the beginning of a product life cycle we're going to keep using the invite system to control our risk," he added. After witnessing a fast, but somewhat bumpy rise, OnePlus in 2015 is focusing on refining its operations and improving its customer service. "This period that we have now is a very good time for us to become a lot more professional," Pei added. "Last year, when we just started the company, on the global side we were just four or five people." Fans of the company can expect the next generation OnePlus flagship phone to arrive in about six months. In addition, the company is developing another separate handset model. "I think its going to be a phone catering to a different type of audience. Perhaps for those who appreciate design over specs," Pei said. In the past, Chinese-branded phones haven't always been respected in the U.S., and have sometimes been derided as shoddy. But OnePlus could help change that perception. The company uses the slogan "Never Settle" in its marketing, and its phones come with top components from foreign suppliers such as Qualcomm, Sony, Corning and Japan Display Inc. Moreover, the Chinese company also heralds the arrival of more quality phones that won't break the bank. "I think in every industry, the innovation has been about how to deliver a better product at a lower price," Pei said. "The smartphone industry will be the same."